One of today's hottest controversies has its basis in an ancient tradition: the use of plants as medicine. Today, a plant with remarkable therapeutic potential is illegal to cultivate, illegal to purchase, unavailable even to researchers who wish to study its medical properties. That plant is Cannabis sativa, best known as marijuana. Despite significant evidence that cannabis has many useful therapeutic applications, it is currently unavailable for medical use. What's more, accurate information on the beneficial properties of marijuana is difficult to obtain, even for healthcare professionals. As a result, most doctors are either ignorant of the plant's benefits or intimidated by its illegal status. CAnnabis in Medical Practice bridges the knowledge gap with comprehensive information from medical, legal, and scientific professionals. 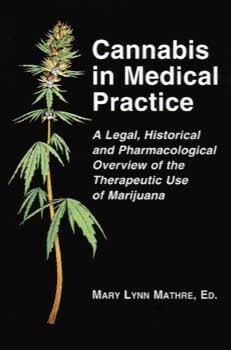 The book provides thorough coverage of the history and pharmacology of therapeutic cannabis, related legal issues, and the use of cannabis in treating particular conditions such as glaucoma, AIDS, cancer, spasticity, and chronic pain. Special considerations include the use of cannabis in pregnancy, the risk of addiction, and the plant's value as nutrient. A look at the economic and environmental potential of hemp completes this groudbreaking work. Mary Lynn Mathre, R.N., is an addictions consultant at the University of Virginia Medical Center and the president of the International Cannabis Alliance of Researchers and Educators (I-CARE).